IT ALL STARTED WITH SIX WORDS. That’s actually one of my six-word memoirs and it’s true. 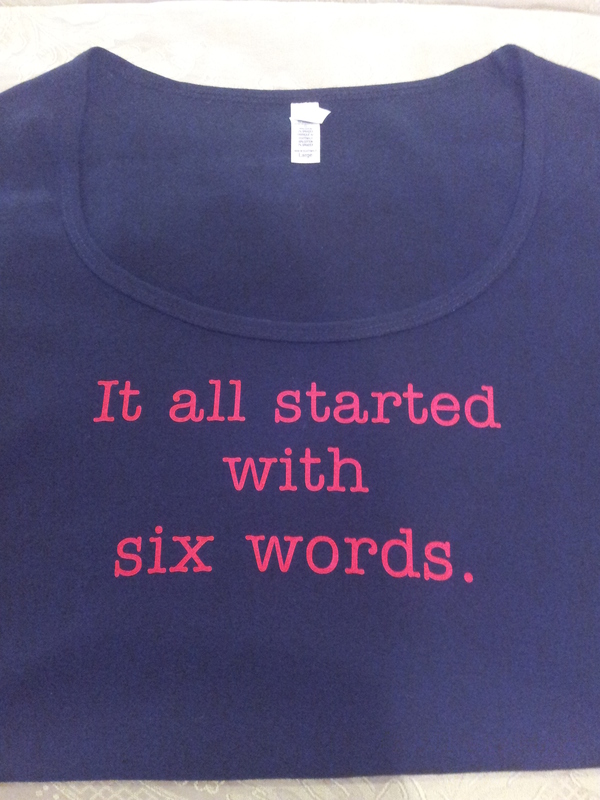 In fact, “It all started with six words” is emblazoned on a tee given to me by my daughter. How did this six-word passion come about? This six-word addiction I have? Well, let me tell you all about it. In 2009, I discovered the fabulous SMITH Magazine http://smithmag.net via the “101 Best Websites” article in Writer’s Digest. Just six words, I thought? What could anyone possibly get across using just six words? Needless to say, the site piqued my interest, and once I read the background which includes the infamous Ernest Hemingway, I was hooked. Powerful—and probably a sad backstory unless the baby was just born with big feet! But I’m guessing it’s a sad story. I’d love to know if their baby was stillborn, if they couldn’t conceive or what the circumstances were. At any rate, I was intrigued. I had to try this. I wa s hooked. Editor Larry Smith (whose wife, Piper Kerman, penned the popular ORANGE IS THE NEW BLACK, by the way) is a great guy and a fabulous editor. I met him in New York City in 2010 after finding out my memoir was published in IT ALL CHANGED IN AN INSTANT by Harper Perennial. Over 200,000 writers worldwide submitted six-word memoirs, and they chose two of mine alongside many celebrities, famous authors and aspiring writers. I was honored. That was true at the time but since that first six-word memoir, I’ve been published in four anthologies, three six-word memoir collections, have three children’s picture books published and am awaiting the release of my debut novel! I’ve been going full tilt ever since. See what can happen in four short years?! This book is an incredibly fun read and is chock full of six-word memoirs from famous authors (Amy Tan, Dave Barry, and the late Frank McCourt, among others) as well as several celebrities including Marlee Matlin, Neil Patrick Harris, the Fonz, Dr. Oz, Marlo Thomas, Chelsea Handler, Andy Borowitz, and a gazillion more. As you can see, some are funny, others sad, and many are poignant. Try it! Go to http://sixwordmemoirs.com but be sure and come back here! The books are also available on the SMITH site and on Amazon. No, I don’t receive a royalty but I still think they’re amazing little bits of writing and they make unique gifts. The second six-word collection that I’m published in is called SIX WORDS ABOUT WORK. The editors at SMITH chose four categories for the book: “My Job,” “Inspirations,” “Bosses,”and “Lessons.” This is a great book for new high school or college graduates. And I was slightly surprised—and pleased—that so many employees really liked their bosses. And I truly did. I reinvented myself as a full-time writer instead of getting a shiny red convertible at mid-life. So, there you have it. My passion for six-word memoirs. I’ve gotten several writers hooked on this fun, short medium and even hosted a contest for Ozarks Writers League about writing and six-word memoirs. 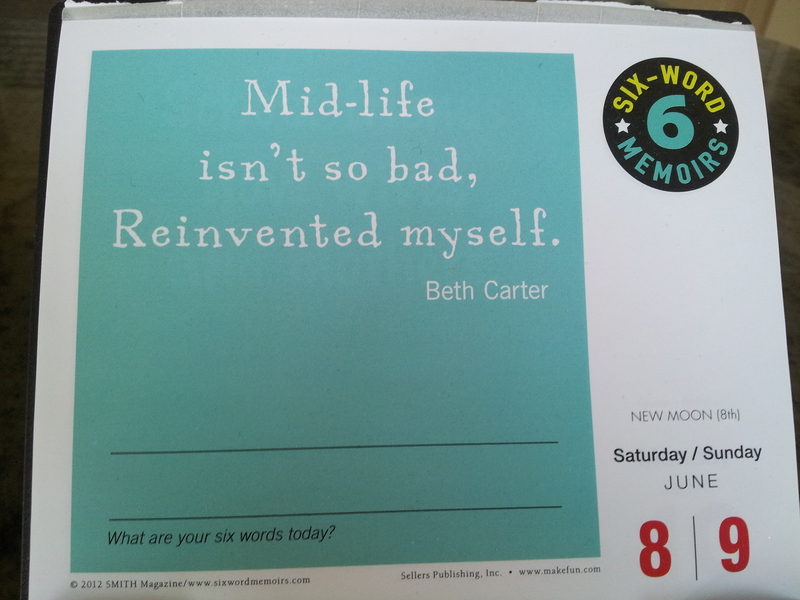 I’m honored to be published in yet another six-word memoir book! THE BEST ADVICE IN SIX WORDS, is a poignant collection of universal wisdom, life lessons, and caution thrown to the wind. With 1,000 contributions from celebrities like Molly Ringwald, Whoopi Goldberg, Lemony Snicket, and Gary Shteyngart, as well as everyday people who’ve learned a thing or two about a thing or two during their time on the planet, readers will pulled into the sometimes hilarious, often serious, occasionally reflective experience of the book.